Consider AB as line segment and C as some point in between, if the length of AC = 2 unit and length of BC = 8 unit, then the amount of weights need to balance will be 8 units on the side AC and 2 units on the side BC, as shown in figure. Now this as obvious concept can be used in solving few problems relating to geometry, taking an example I can explain how.. 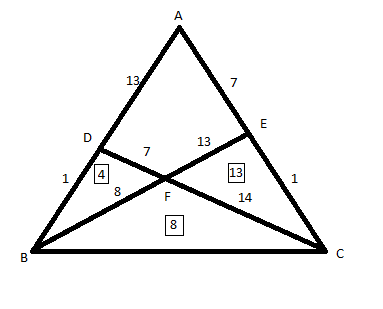 Question : – Consider the case below here are of small triangles contained in big triangle are known, now we have to find the area of whole triangle, I bet you can’t do this question in less than 10 minutes if you don’t know this method. Give it a try if you want to, before reading the solution. Here, numbers written are nothing but ratios of sides, we know the area and ratio of sides. Therefore, we can find unknown area of quadrilateral. Picture below shows the actual areas in squares and ratios of sides. Using this we can say that, ratio of area of triangle ABE and triangle BCE = (4+x)/(8+13) = 7/1, where x is area of quadrilateral.